God Brings Donors to Mercy from All Over the U.S.
Mercy is fortunate to partner with generous donors like Troy Tenneson to help young women find their freedom free of charge. It’s not uncommon to hear amazing stories of how donors who don’t live near a Mercy home come to know about Mercy. Troy, from Washington, is no exception. Due in part to Francesca Battistelli’s “He Knows my Name” music video, comes yet another incredible story of the Lord orchestrating His people in a way that aligns for His purpose. Earlier this year, a woman named Angela from Washington was exchanging music videos with a friend when she came across Batistelli’s video for “He Knows my Name”. Angela was looking for an organization to partner with and immediately knew that God purposefully led her to Mercy through that video. She committed to taking part in the Run for Mercy 5k and Family Walk in Roseville, CA and to raising money for the organization leading up to race day. Angela ran the race and ended up being the top individual fundraiser for the event. In the midst of it, she shared with a friend at work what she was up to. That friend you might ask? Troy. When he learned of Angela’s plans to participate in the race and fundraise for the organization, Troy gave his first donation to Mercy. As a thank you for his donation, Troy received a copy of Nancy Alcorn’s book, Echoes of Mercy. 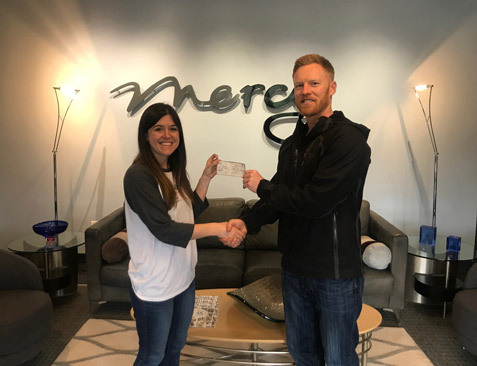 During a recent trip to Nashville, Troy felt prompted to stop by Mercy’s Corporate Headquarters and present a check to Director of Fundraising, Lauren Hobar (pictured). Through this Q&A, God’s divine glory shines and Troy shares how God used Angela to inspire and encourage Troy in a new way. Q: How did you come to know about Mercy? A: I first came to know about Mercy through my friend Angela [who learned of Mercy through Francesca Battistelli’s “He Knows my Name”]. Her and I had a talk about our tithe money just weeks before she found out about Mercy. I told her that I lean on the Lord to show me where my giving can “swing the biggest hammer” in building the Kingdom. After Angela found Mercy through a music video, she signed up for the Run for Mercy in Sacramento. I donated to her run. Q: What inspires you most about Mercy? Why? A: As I read the book, Echoes of Mercy, Nancy’s faith and story just shouted through the pages. Her total commitment to God, providing a place free of cost to hurting young women, accepting no government funds and in turn tithing 10% to other non-profits. And then being tested to deviate from those principles, how she made those hard choices decades ago, setting the foundation on which God could and would build, through Nancy, such a place for His daughters who have been hurt and broken, to go to for love, safety and healing. Q: How has giving to Mercy changed you? A: Mercy Multiplied in turn gives me courage to stand by my convictions in a world that routinely challenges faith and God. Mercy Multiplied shouts God’s grace and goodness and trustworthiness. If Troy’s “Me in Mercy” story has inspired you to give, please check out the many ways to become a Mercy partner. Plus, visit our Tour A Home page to schedule a free tour of one of Mercy’s four U.S. homes located in Nashville, TN; St. Louis, MO; Monroe, LA; and Sacramento, CA.